Any material related to Radionics and Psionics only. There's a mobile version that you could pay $1 for a ten day trial period (you can keep renewing at that rate) or 24 for a lifetime subscription. secondrunner wrote: There's a mobile version that you could pay $1 for a ten day trial period (you can keep renewing at that rate) or 24 for a lifetime subscription. I see, thanks for the advice! I really wonder how it works, but its legit! Do you have to direct conscious attention to the radionic visuals? Is it fine if minimise the window? Also, are you aware of a safe place to get some more sigils to test? From my experience I have better result while letting the program run full screen while i'm not in the front. I remeber having read that is ok to minimise it as far as the screen is on. http://www.psionicpower.com/ which is the evolution of xtrememind forum have some cool sigils in their picture section but not much activity in the past couple month. And for your question about the sigil, I guess it's a magnetron powered by the flower of life symbol that act as a core engine of the application (I presume). 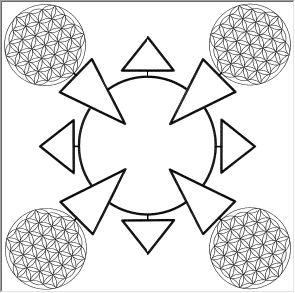 You may find good basic knowledge by studying the flower of life and the sacred geometry which have been use by many civilisation thru the past years. Thank you very much liquid. I just purchased the set.